Utopia was a project featuring Amon Düül II‘s producer/musician Olaf Kübler (saxophone, Moog) and the same group‘s bass player Lothar Meid. 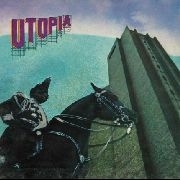 Utopia‘s s/t album was recorded in 1972, at the same time and space as ‘Wolf City‘ by Amon Düül II. Taking full advantage of those circumstances, the Utopia recordings also incorporate Düül-members Renate Knaup (vocals), Weinzierl (guitar) and Karrer (violin). This reissue comes with remastered sound, taken from the master tapes.